Jenny Wang’s life has taken her from birth in China to childhood in rural Pennsylvania and now living in Washington, DC, with a busy career as a public relations executive – but she’s not done traveling. She’s eager to explore more of the world when time will allow, in particular Morocco. Although Jenny has never been to the African country, she’s long been fascinated by its architecture, music, food and other aspects of its culture, and wants to visit. So it made sense that one of the restaurants she suggested for our dinner interview was Moroccan-themed Marrakech. 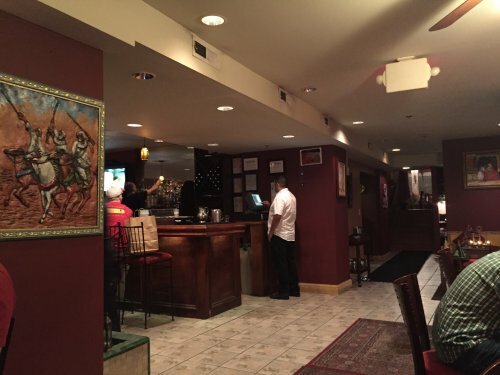 Located just south of Dupont Circle, diners enter through massive, heavy wooden doors into a tiled dining room adorned with intricately designed rugs, bench seating littered with plump, comfortable pillows, and artwork evoking Arabian scenes. For example, a picture of a Moroccan castle surrounded by palm trees was hanging on the wall to Jenny’s left. 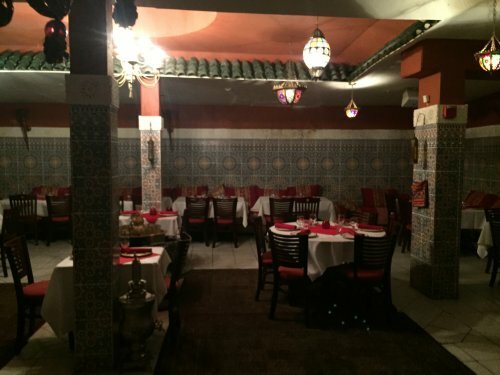 There’s also a very large back room with the same décor save for a large rectangular space in the middle where a belly dancer sometimes performs. Alas, they didn’t show up on the Thursday that Jenny and I met, so all bellies remained covered. But that was probably for the best, as the menu promised that our stomachs would be bulging by the end of the meal. The handful of other diners already seated seemed to be having a great time with their huge portions. Jenny, 25, explained how she had studied abroad in England back in 2011 and traveled throughout a lot of Europe, but never got the chance to visit Morocco. “That’s a big regret,” she said, but vowed to fix it in the future. And until then, we’d always have Marrakech. 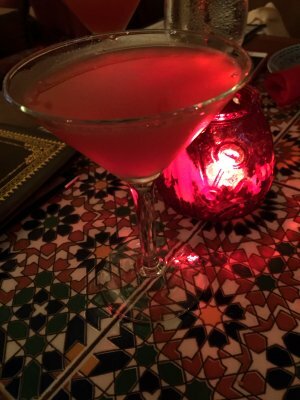 We started dinner with the restaurant’s namesake Marrakech martini, a potent, sweet and tasty combination of Grand Marnier, Malibu, lemon juice, and pineapple. 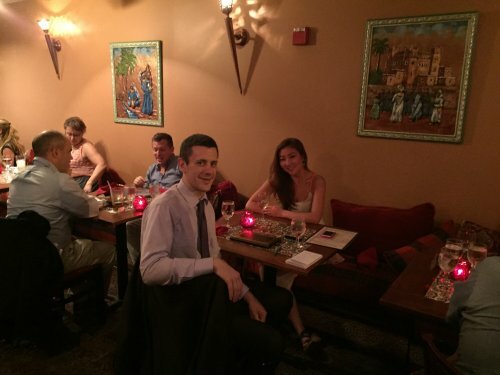 While we sipped at our drinks, Jenny said she didn’t have much trepidation about dining with a stranger because she’d already done such a gamble with the Washington Post‘s Date Lab, which sends two volunteers out on a blind date. Jenny was inspired to take part after hearing about it from colleagues at a public relations firms where she worked. The two had fun on the date, she said. The daters are given a disposable camera to take pictures at whatever bar or restaurant they go to. And they share details of the date afterward with the Post. Jenny called Date Lab an “interesting, bizarre experience,” particularly the postmortem of the date and the subsequent article about it. But having her picture and comments thrust into the national spotlight meant that anonymous internet commenters could now weigh in with their thoughts. “Some people were asking why I was so dressed up, others were criticizing him for wearing a plaid shirt,” she said, laughing off the acerbic comments. 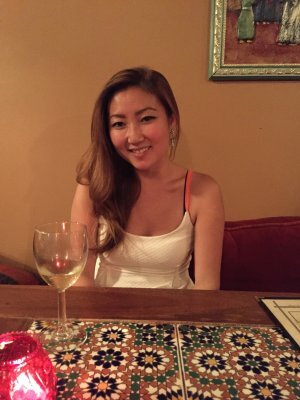 She doesn’t regret doing Date Lab, and it meant she was more than happy to share her story for Dining With Strangers. And it’s a tale that spans the globe. Jenny was born in China but her father, a professor, left soon after her birth to take up a teaching job in the United States. Her mother than went to join Jenny’s dad one year later, so instead she grew up initially with a nanny and her grandparents back in China. Then at the age of four Jenny moved to the States to live with her parents in Connecticut. They lived there until she turned nine, at which point they moved to rural Huntingdon, Pennsylvania, where Jenny’s father took a job teaching at liberal arts Juniata College. “It was a low socio-economic area, with a high teen pregnancy rate. It’s the kind of place where they have the first day of hunting season off school,” Jenny said. “As a small town there was not a lot of diversity, so it was very weird for me being the only Asian kid in my grade. Some people would stare at me because I looked different. It was upsetting as a child because as a kid, the worst thing you can be is different, you just want to blend in,” she added. By the time Jenny reached the age to go to college, the racist taunting had gone away. And she wasn’t in a huge desire to leave town, so she enrolled at her father’s college. She studied for an undergraduate degree in communications. Then in her sophomore year “on a whim” as she told it, 20-year-old Jenny came to DC for a summer to do some canvassing for various groups. 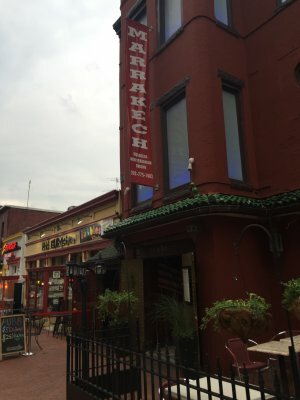 It was a way to experience a new place, and it made her immediately fall in love with the District. “I didn’t realize I was a city person until I came here,” she said. So the next summer she returned to do an internship with a public relations company, an industry she’d long been interested in joining. Realizing that her communications degree was not the most practical for that career, she then pursued a one-year strategic communications program at American University in the city. “It was more geared to actually doing PR,” said Jenny, now working as an executive in the sector. It turns out that Jenny had heard of some of the DC residents that I’ve interviewed, including the time I had dinner with Craig Sherer, who is making a video documentary series about dating in DC. A small city after all. Dinner with Craig was at an American restaurant a reasonable walk away from Marrakech, but with very different food on offer. 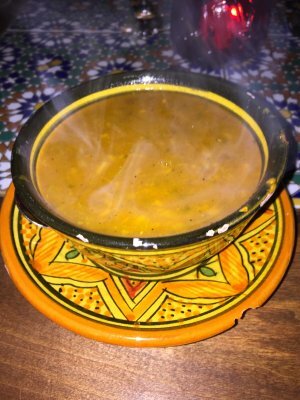 At the Moroccan restaurant, I started out with a bowl of the harirar soup, with tomato lentil, chick peas and saffron ginger seasoning. It was piping hot and delicious, with a nice hint of spice and incredibly moreish despite the baking heat outside not exactly suggesting a prime time for warm soups. It was so good that I demolished two freshly baked bread buns to mop up the leftovers. Jenny opted for the lighter fare of the Marrakech salad. 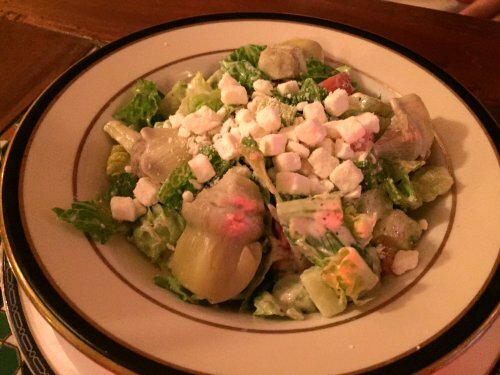 The salad combines lettuce, tomato, olives, onion, cucumber, artichoke, Feta cheese and what the restaurant calls a “creamy sauce” — I’m clueless as to what flavor that sauce might have because I never asked my dining companion, but she seemed to enjoy it. While we ate, I persisted on the public relations theme and asked what it is that Jenny likes about her career. She didn’t have to think long before answering. “I love just all things mass media. I get to influence what’s put out there, the messaging, what’s in the news in terms of publications or what people talk or read about,” she said. Her current role involves promoting public health, which could be a campaign to get people to wear seatbelts or get checked for cancer. “It’s a lot of social marketing for the public good,” she added. Other aspects of the job that she likes are the ability to meet a range of different clients, and that it’s fast-paced work where she can juggle several tasks at once. A little bit of grief from a reporter isn’t going to bring Jenny down, however — at least based off what I saw from almost two hours with her at dinner. She has a constant energy about her that never flagged, and there wasn’t a single moment of dead air in the conversation. It’s a cliché but there’s no such thing as a typical day in public relations, she said. Jenny will be checking her phone and email from early in the morning to late at night, working on anything from letters to the editor of newspapers to crisis management for her clients. She wasn’t able to divulge any specifics of projects she’s working on, but said it’s plenty to keep her busy. So what’s her ultimate goal in the industry? Before she could answer, our waiter returned with our main course. “Oh, this looks great!” said Jenny. Indeed it did. We’d both ordered the lamb tagine. “I will probably eat all of it. My friends joke that I eat like a 300 pound man,” Jenny said with a laugh. 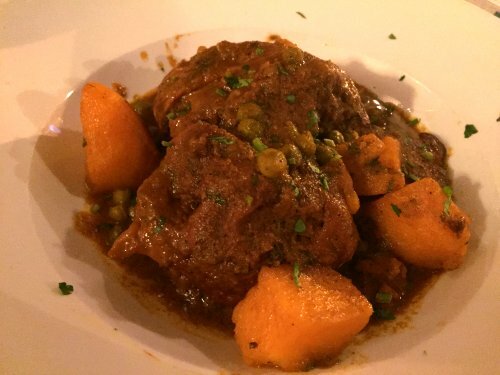 The tagine is braised lamb with red potatoes and sweet peas, essentially a hearty stew. The lamb was wonderfully tender and the rich, dark sauce that the meat sat atop was a perfect complement. After a few bites, Jenny and I were in agreement on how good it was. Between bites, she explained that she has a near-term goal of being a vice president at a public relations agency by the age of 30, but nothing more specific than that. She also predicts that she’ll stay living in DC, as she became a condo owner last year — and might want to take on more properties in future years. “It’s a very Asian thing to build your equity in real estate, I got that mindset from my parents,” she said, flashing her broad, warm smile. Until the day when Jenny becomes a real estate mogul, she’ll stay focused on her career in public relations. As we neared the end of our dinner, she reiterated why she loves her work. “I like the fact it’s not so monotonous. It’s a cool thing to be able to be a part of the news cycle in some way, and to affect public opinion by affecting what people see or read or hear,” she said.